Kyosho Turbo Optima 4WD Racing Buggy Kit - Pre Order Now! Due to arrive mid to late April 2019! Recreation of the original, but updated with the latest racing tech! 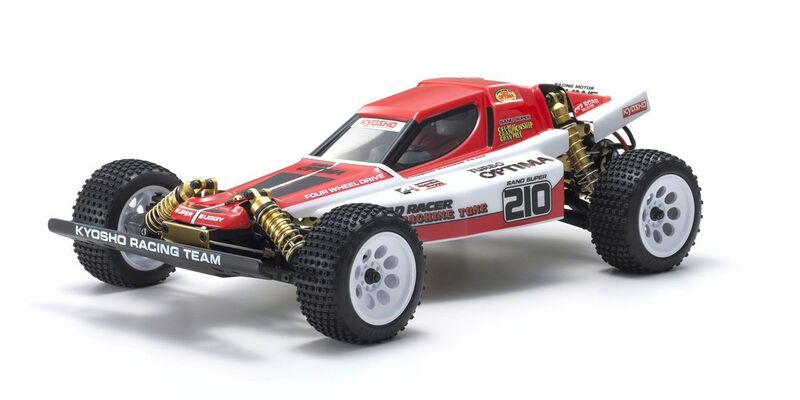 After the dynamic impact of the Optima was felt across the R/C racing scene, the Turbo Optima launched in 1986 as the strongest machine in the series. Until now. In addition to large diameter tires, large capacity pressure shocks, front & rear stabilizers and Le Mans 240S motor, the immortal Turbo Optima has modernized for 8.4V power and makes its debut as the 7th model of the vintage series. Key components of the Turbo Optima chassis have been redesigned to meet the demands of modern racing conditions and power sources, and share DNA with the Optima and Javelin. The new Turbo Optima is not simply a reproduction of the original and includes gold anodized parts that were optional upgrades on the original, gold shocks with dial adjustment of chassis height and new modern block pattern tires. Higher specs and design features deliver modern performance standards and visual impact that captures the magic of the original. ●While a faithful reproduction the original Turbo Optima, each key performance component has been revised for compatibility with modern power sources. ●4WD belt drive. 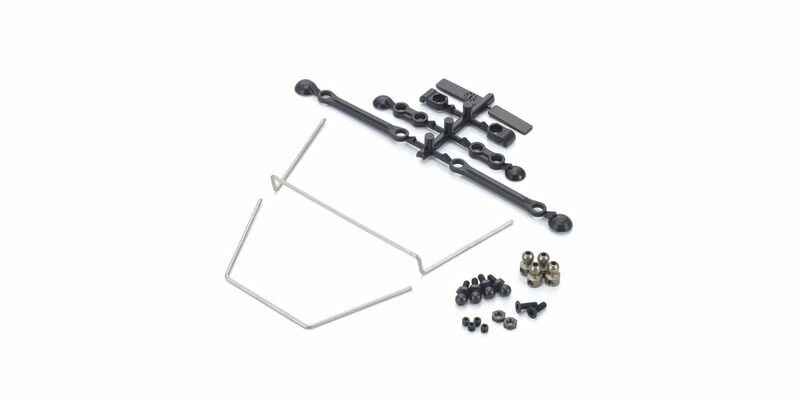 Pulley for chain is also included in the kit so purchase of an optional chain can change the drive system. ●Equipped with FRP radio plate that is compatible with major brand ESC’s (speed controllers). ●Three toe angle settings ( 0°, 1°, 2°) can be used by inserting resin bushes into the rear hub carrier. ●Modernized aluminum hexagon wheel hubs can be securely fixed with set screws. ●Equipped with metal counter gear. ●Full ball bearing specifications (18 bearings). ●Includes separate helmet and polycarbonate body. 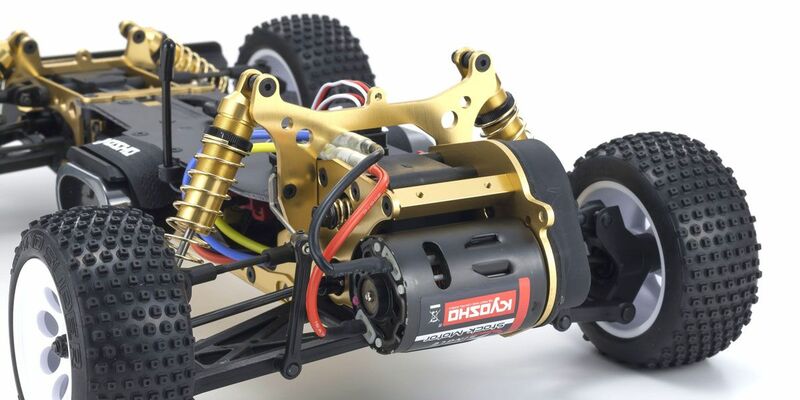 ●Battery stays are compatible with various modern batteries and secured with hook and loop fasteners (battery strap with KYOSHO logo) for easy removal of battery. ●Hex screws used for assembly provide secure construction. Simple design of the aluminum backbone-style chassis realizes high rigidity. 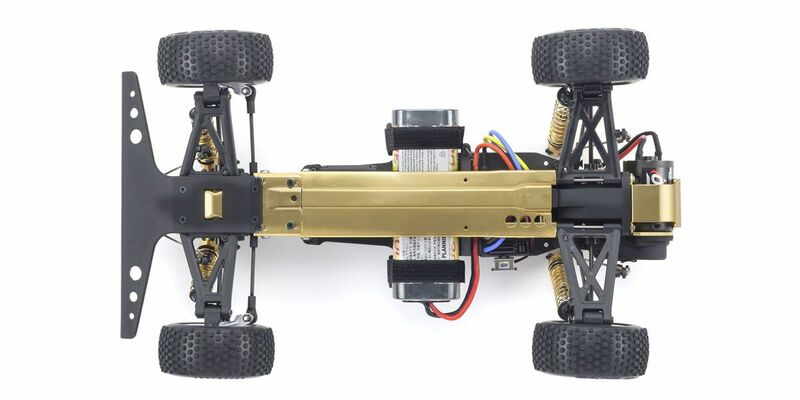 A total of 15 key gold anodized aluminum components that were optional upgrades in the original such as main chassis, shock stay, and motor guard are included as standard. 6061T6 aluminum alloy is used in the main chassis, shock stays and plates for superior strength and corrosion resistance. Countersunk screws reduce the number of nuts used and produce a flat finish. Gold anodized under guard is also included as standard. 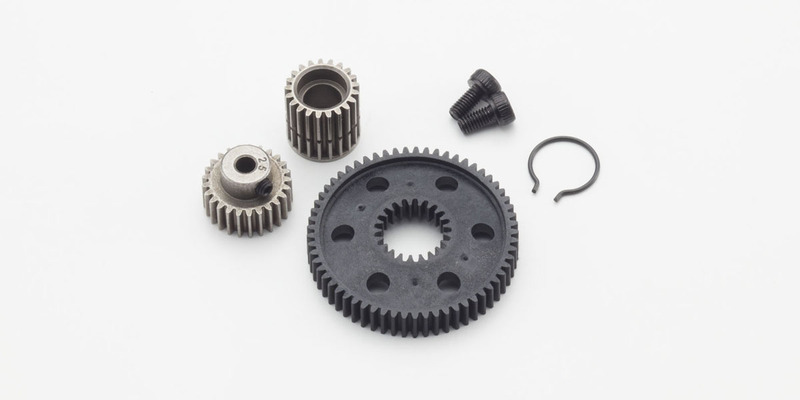 Sintered alloy 48 pitch gears combined with high impact nylon gears and newly added slipper clutch will cope with the current power plants. 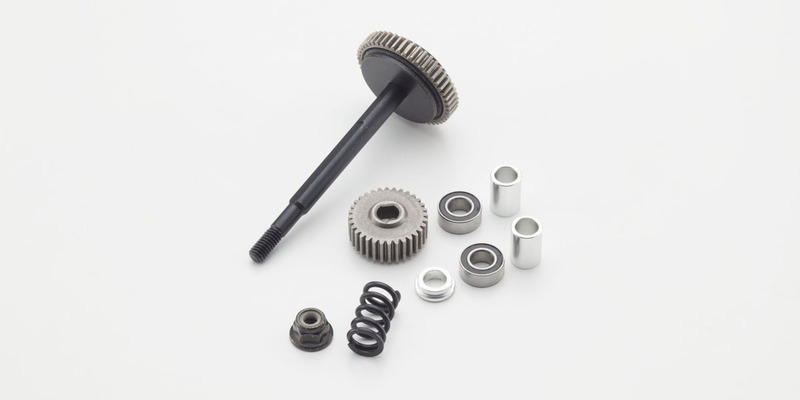 The gearbox is equipped with a slipper clutch that protects the drive system from sudden load changes such as jump landings and is easily adjustable for compatibility with various surface conditions. Aluminum oil shocks modernized with dial adjustment of chassis height while recreating the style of the original. 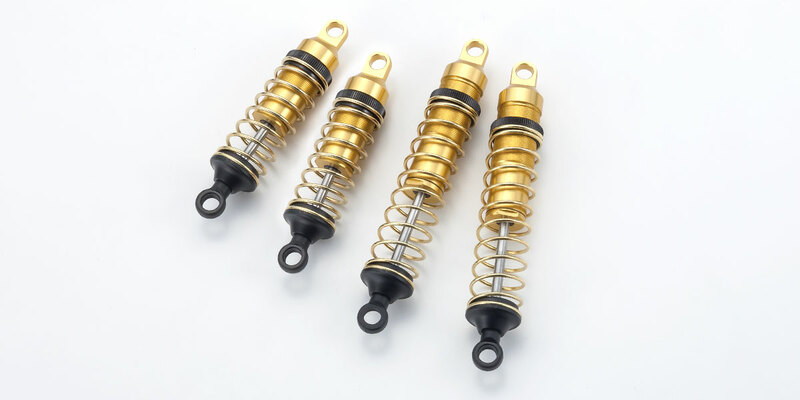 Refined shock absorber setting. 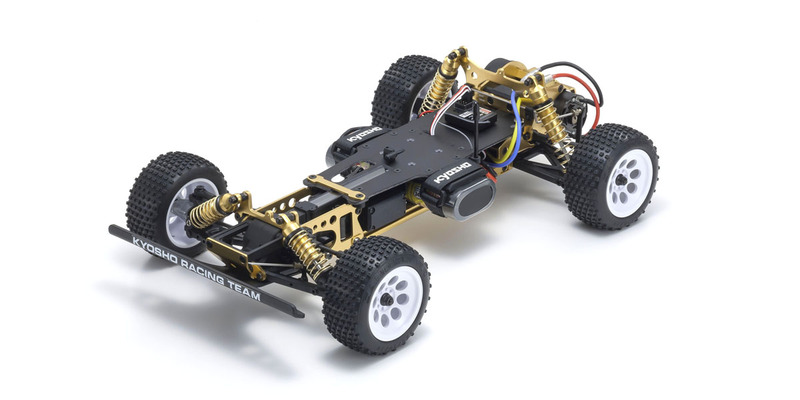 Reliable movement and long stroke of the double wishbone suspension with reinforced arms increases control feel. Stabilizers are equipped on front and rear to deliver sharp performance through suppression of chassis roll through corners. The Turbo Optima’s wider body design (than the Optima) for compatibility with the 8.4V battery of 1986 has been accurately recreated. The packaging color scheme can be reproduced with the masking sheet & Decals included. While still following the style of the original, the new Turbo Optima features modern block pattern tires for evolved running performance. 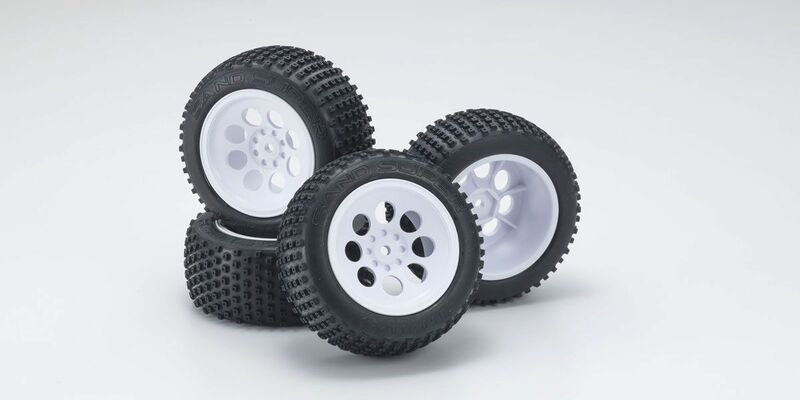 Stylish large diameter (50mm/2-inch) wheels have evolved with a one-piece design and are included as standard.